AI and edge computing are the new commuter vision battleground. IntelliVision, a pioneer and leader in AI/deep learning video and audio analytics software for Smart Cameras, today announced availability of its full product line of intelligent video analytics software on Ambarella’s most advanced S5L IP camera SoC (System on Chip). The software will be demonstrated in the Ambarella booth at CES 2018 in Las Vegas. IntelliVision’s video analytics products are in use in over 3 million cameras around the world. IntelliVision has been named a Red Herring 2017 Global Top 100 Company and has been awarded Entrepreneurial Company of the Year 2017 in Security and Video Analytics by analyst group Frost and Sullivan. 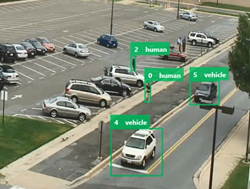 IntelliVision is a market leader in AI and Deep Learning video analytics software for Smart Cameras, providing video analytics solutions for several markets including Smart Home/IoT, Smart Security, Smart Retail, Smart Business, Smart City and Smart Auto (ADAS). IntelliVision technology has been recognized as the Brains Behind the Eyes™ for many applications using cameras to analyze video content, extract metadata, send out real-time alerts and provide intelligence to other home, business and security systems. IntelliVision provides the largest suite of video analytics products in the market today. Its products are used by Fortune 500 companies, the US Government and many leading brands. IntelliVision is headquartered in San Jose, California with offices in Asia and Europe.